Whether your wedding style leans more vintage, modern, or classic, the creative use of a mirror can elevate your décor. Here, check out some of our favorite ideas. An ornate mirror provides a lovely backdrop for your ceremony. A mirrored base for your ceremony structure takes it to the next level. Mirrored cubes in varying heights add visual interest to an indoor ceremony. Create a dramatic backdrop with mirrored cubes overflowing with candles and simple flowers. 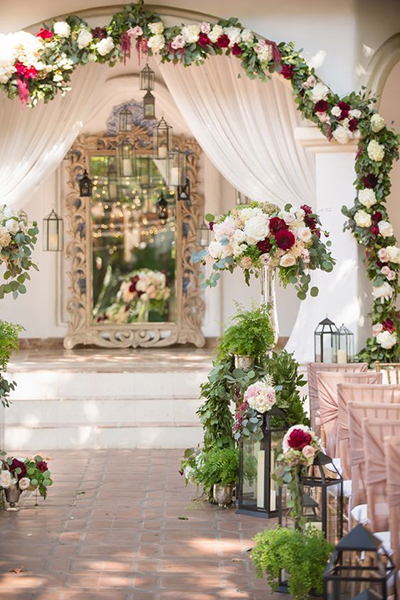 Expertly balance modern style with classic elegance by covering a mirrored ceremony structure with romantic flowers. Position floral disks so that the print will be reflected off of the ceremony structure. You'll feel like an ice princess with this unique backdrop. A mirrored window above a makeshift fireplace adds country charm. Write your vows on an oversized mirror for a memorable backdrop. Welcome your guests with a sweet mirror sign. Write a thank you to your guests on a beautiful mirror. Print your seating chart on an ornate mirror for a show-stopping display. A three-panel mirror with silhouettes of the bride and groom adds a vintage touch. Clip your seating assignments to a wire across a mirror. Even easier: Tape your seating assignments onto a mirror. A mirror printed with your names will also become a beautiful part of your home décor after the wedding. Display your menu on an eye-catching mirror. A tabletop mirror works perfectly as a glamorous table number sign. A mirrored bar enhances the beautiful natural backdrop. Transform a framed mirror into a swinging drink display. Pure glam — pair mirrored cubes with crystals and white flowers. A mirrored base is elegantly paired with candles and soft flowers. Dripped metal vases are a unique take on mirrored centerpieces. A textured mirror centerpiece provides a wonderful contrast to a vintage-inspired table setting. A simple centerpiece stands tall against a round mirror. Gold-painted mason jars and candles cast a romantic glow against a mirror. A mirrored tray provides a beautiful base for a vintage centerpiece. Mirrored chargers with crystal edges set the tone for a glamorous modern wedding. Minimalist chic is exemplified by a mirrored tabletop paired with ghost chairs and candelabras. A reflective tabletop enhances the natural beauty of this garden wedding. Let the light bounce between mirrored vases and a mirrored tabletop. Mirrors, crystals, and gold come together for a sleek, modern look. A tiled mirror tabletop adds a unique touch. Trim costs by using a mirrored runner instead of a full table panel. Dress up individual square mirrors with pearls and candles. Repurpose a vintage dresser for your guest book table. A mirrored tabletop etched with your wedding date makes a perfect sweetheart table. A mirrored wall provides a fun backdrop for your photo booth. Jazz up your dance floor with a wall of mirrors. A vintage collection of mirrors creates an eye-catching display. A garden goes glam with oversized gold mirrors.